Fernando Alonso admitted his overtake to take seventh place from Sebastian Vettel late in the Chinese Grand Prix was "not a fair fight" as the Ferrari struggled through the latter stages of the race in the aftermath of his collision with Max Verstappen. Alonso has scored points in every race this season, despite failing to make Q3 in Melbourne, Sakhir and Shanghai. 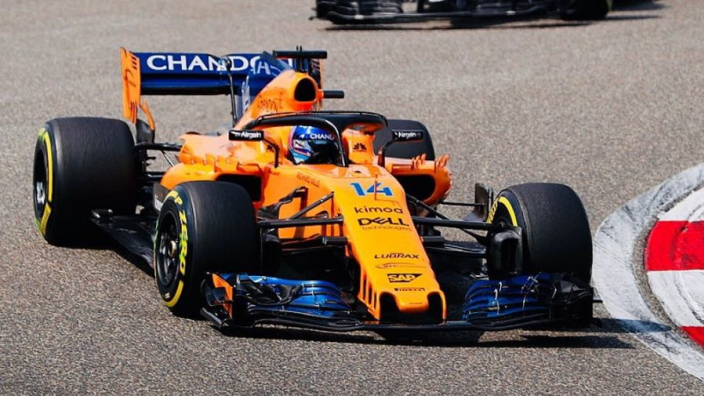 Sunday's race in China had a sweet finish for Alonso as he sneaked down the inside line of Vettel on the penultimate lap to offer another reminder of his sharp racing instincts. Vettel had collided with a charging Verstappen earlier in the race and faded to the finish, perhaps taking some of the gloss off Alonso's overtake for the veteran. "It was good," said Alonso. "Obviously it was not a fair fight because Sebastian had damage on his car and I was a little bit quicker on the corners. "I was surprised when I saw a Ferrari not going too fast at the end. "I asked what was the problem and apparently he had damage on his car so he was struggling a little bit on the corners. "He was running very wide in the corners so in the first opportunity I saw the door open and went for it and in the end at one point the track finished so he kept going until there was grass, so you need to back off at one point." Alonso had pitted two laps before the safety car was brought out, which allowed the Renault of Nico Hulkenberg ahead to pit for fresh tyres and maintain place ahead of the McLaren. "The safety car didn't help, definitely," Alonso said. "We were executing a one-stop strategy a little bit differently, with a very long first stint that I think would have paid off in the end, but I think the safety car opened the opportunity for everybody to put a new set of tyres and that was a shame for us. "At the same time I think it was a great battle and we were able to overtake. It was a nice feeling and great result for the team again."